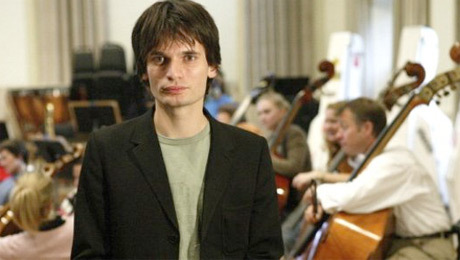 Radiohead guitar guru Jonny Greenwood has branched out into other style of music with his soundtrack work, and he is once again taking on the role of composer, this time writing a new piece of music for the Australian Chamber Orchestra. The piece is called Water, and Greenwood apparently worked on it with the orchestra following Radiohead's Australian tour in late 2012. According to Melbourne's Noise11 [via Consequence of Sound], the work sounds very different from anything Greenwood has ever done, either solo or with Radiohead. The piece is slated to premiere in 2014 in Australia. It was partly inspired by Indian classic music, which Greenwood heard while on a trip to that country. "I'm so used to closely recorded sounds, it's always a jolt to realize that the 'in the room' sound of an orchestra is a different animal from a recording," he said. Below, see 2012 footage of Greenwood performing with the Australian Chamber Orchestra in Sydney.